A Dangerous Place is the eleventh novel in the Maisie Dobbs series. Maisie is a private investigator who served as a nurse at the front during World War One. 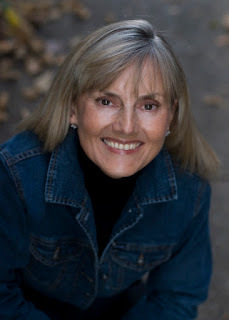 Working with an ex-soldier, Billy Beale, she solves crimes related to the war. Unlike Winspear's previous novels, A Dangerous Place is set in 1937 and not the 1920s, and in Gibraltar rather than London. By 1937 Maisie has changed. She is a widow who has not only lost her husband and baby daughter but also her faith in herself as a detective — can she still solve crimes? Does she remember what she has been taught by her mentor, Dr Maurice Blanche? Can she return to England and pick up her life again as a single woman and as a private investigator? As the story progresses it becomes increasingly clear that despite her fears, Maisie has in fact not lost her skill as a private investigator. As she solves the mystery of Sebastian Babayoff's death she recalls the valuable lessons she had learned as a detective in London in the 1920s. 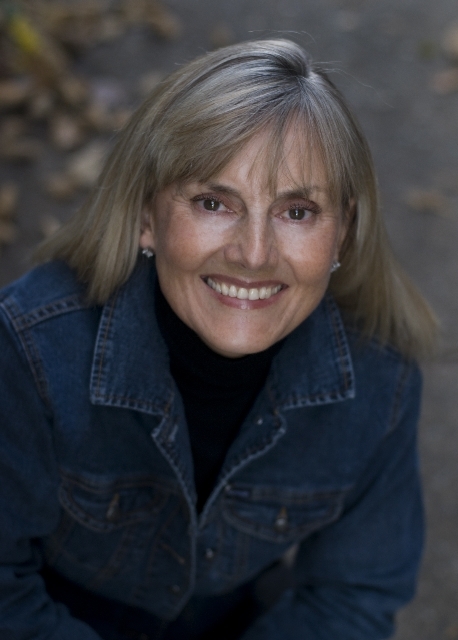 Describing herself as an advocate for the dead, she forces herself to remember everything she was taught by Maurice Blanche: "the dead have stories to tell — that even following the most dreadful passing, there is evidence to suggest what had happened to that person" (38). Maurice had also taught her that "duty [is] about doing all in our power to bring a sense of...a sense of rest and calm to those left behind" (38). Like all good detectives, Maisie knows that her primary task is to restore order so that all can move on, including herself. A Dangerous Place gives many valuable insights into Maisie's most important principles: "Knowledge is the light. Come out of the darkness one lamp at a time. Paint your picture of what came to pass question by question — and remember, some are never meant to be answered because the response closes the door to knowledge you most want and need" (45). As she reflects on the dreadful images of her husband's fatal accident and her unborn baby's death shortly afterward she recalls what Maurice once told her: "Watch the image, and let it go. Take note of it, know that it is there, and allow it to move away, across the landscape of your mind's eye.Allow yourself to see connections"(111). Maisie remembers these things both for herself and for her case as she buries herself in retracing Sebastian's last days and discovers the reason for his murder. There is, however, one important principle that Maisie has forgotten and one which she has always followed in previous cases, namely to spend time with the victim. Maisie has not seen Sebastian's body, and, even more important, she has failed to investigate his past. It is not until halfway through the story that she realizes these omissions; characteristically, however, once realized, she sets about rectifying them with admirable determination and efficiency. By chapter 15, Maisie is clearly once more the brave, determined, and sensitive investigator of the previous novels. In this chapter she follows Sebastian's trail to Spain, a country now torn by war. It is here that she finds the answers to her questions and also acknowledges for the first time that she not only needs to rediscover herself as a detective but also to return to her former profession as a nurse and work through her pain both physically and emotionally. On a short visit to a small hospital in the mountains outside Madrid Maisie is given the opportunity to tend wounded soldiers. Her decision to return to the hospital at the end of the novel is an acknowledgement that she has finally learned to shoulder her grief. 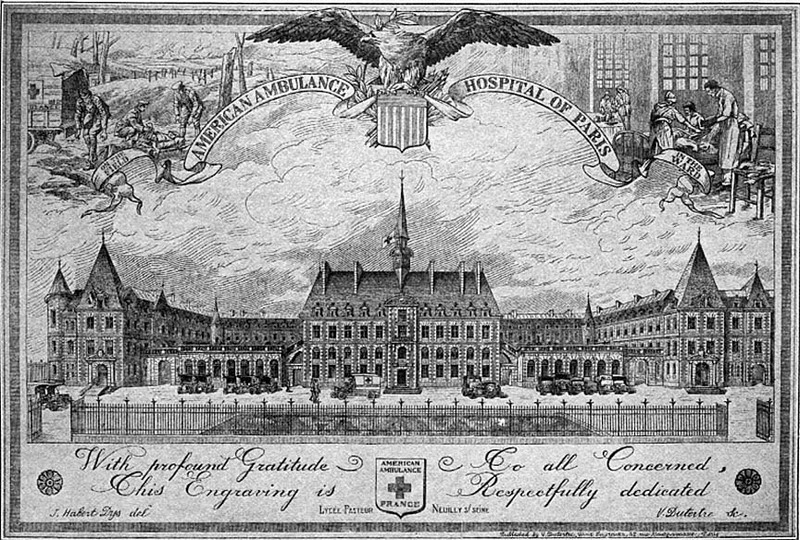 With her case solved and with her therapeutic work at the hospital complete the reader is in no doubt that she will be able to return to England and her family and pick up the threads of her former life. Gibraltar is an excellent choice for the setting of A Dangerous Place. As the narrator explains, "perhaps someone who felt the depth of scars across her heart every day could be at home in a place with so many reminders of war, with war still so close, across the border" (87). In Gibraltar and Spain Maisie learns how "to slay the dragon of memory" (90). It is no coincidence that the name of the baby girl Maisie delivers in the Spanish hospital on her first visit is "Hope". Maisie is ready to move on. And indeed so are we as readers as we eagerly await the next episode in the adventures of private investigator Maisie Dobbs. 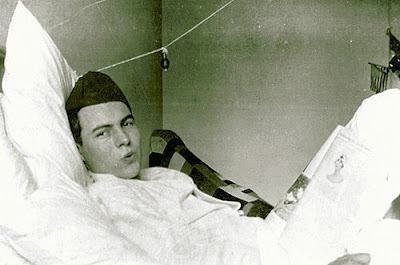 While he was recuperating from his wounds in Milan, Ernest Hemingway wrote this letter to his parents. Meanwhile, you have certainly already heard of the glorious victory of the Germans against France, England, and Belgium. It is among the most wonderful things that have happened. But it does not surprise me: it is not any different from the war of the Greeks against the Persians. . . My friends know it, I have often said to them, I never had any use for all foreign music. It always seemed to me stale, empty, disgusting, cloying, false, and awkward. Without exception. Now I know who the French, English, Russians, Belgians, Americans, and Serbians are: barbarians! The music said that to me long ago . . . But now comes the reckoning. Now we shall send these mediocre purveyors of kitsch back into slavery. Schoenberg was hardly the only artist to support his team during the First World War. But what strikes me in his stance here is something you often see when intellectuals go to war: their tendency to interpret the war in the most parochial terms imaginable, that is, as an expression of their own causes and concerns, no matter how alien those might be from the state waging the war. 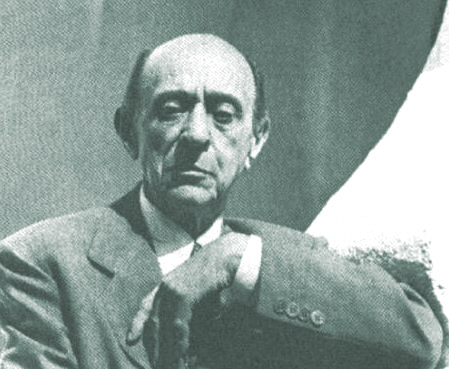 Not only did Schoenberg see German war aims as the defense of German/Viennese culture (again, he was not alone in this), he also saw it more specifically, and improbably, as an extension of his own battle against retrograde tendencies in modern music. As if the Kaiser had read Harmonielehre and decided to march into Belgium on behalf of atonality. . .
A state goes to war for its reasons. It takes an especially potent form of imaginative power to assume that the academic question that happens to be on your mind at the moment is somehow shared by the men and women who are leading that state. . . In September 1914, when the line of battle surged close to Paris, a dozen automobiles given by Americans, hastily extemporized into ambulances, and driven by American volunteers, ran back and forth night and day between the western end of the Marne Valley and Paris. 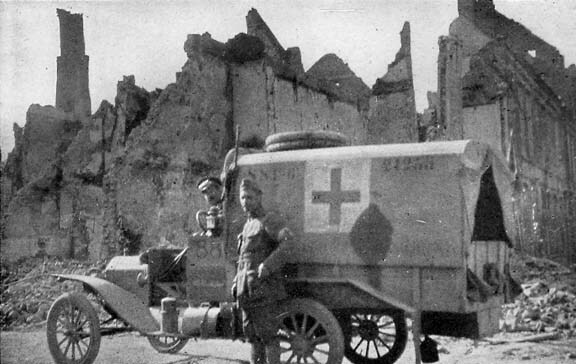 During the Autumn and Winter that followed many more cars were given and many more young Americans volunteered, and the battle front having retired from the vicinity of Paris, these sections of motor ambulances were detached from their headquarters at the hospitals at Neuilly and Juilly and became more or less independent units attached to the several French armies, serving the dressing-stations and army hospitals within the Army Zone. 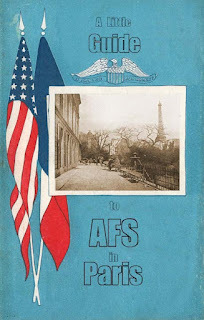 The World War I Tours American Monument is located in the city of Tours, France, 146 miles southwest of Paris. The monument commemorates the efforts of the 650,000 men who served during World War I in the Services of Supply (SOS) of the American Expeditionary Forces (AEF) and whose work behind the battle lines made possible the achievements of the American armies in the field. The city of Tours was its headquarters during the war. 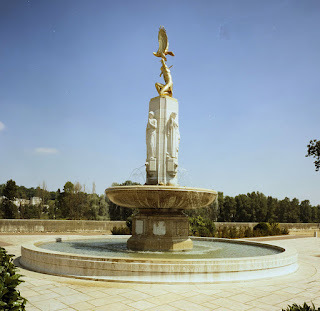 It is located just east of the southern end of Pont Wilson, which crosses the Loire River and consists of a handsome fountain of white stone with a gold gilded statue of an American Indian holding an eagle. Around the column are four reliefs depicting allegorical figures representing the four principal divisions of the SOS organization—construction, distribution, procurement, administration—and in the lower part eight coats of arms of French cities where important installations of the SOS were located: Tours, Brest, Saint-Nazaire, Le Mans, Is-sur-Tille, Nevers, Neufchateau, and Bordeaux. 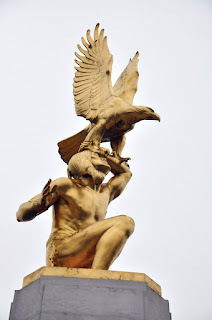 Most prominent are the figures atop the structure, but the beautifully executed eagle and Indian, upon reflection, raise some questions for me as to their relevance to what is being commemorated with this memorial. What exactly do they have to do with the mission and accomplishments of the SOS? The eagle, of course, has always been an all-purpose American symbol. What, however, does the human figure represent? Is he, the American people, sending American vitality to France? Certainly, American Indians were well represented in the AEF, fighting well wherever they appeared and contributing two of the great traditions of the war: the first code-talkers in U.S. military history,and "the Indian Sgt. York," Joseph Oklahombi of St. Etienne (another prospective Medal of Honor candidate IMHO). I guess where I'm a little stuck, however, is the specific connection to the Services of Supply. The individual clearly does not represent a U.S. soldier (or stevedore or engineer). Then again, the same question can be raised about the Indian-head emblems adopted by the Lafayette Escadrille, and the 2nd "Indian-head" Division of the AEF. Those figures are not contemporary aviators or infantryman. All I can gather is that the Tours figure is another embodiment of America, adding a human dimension to the American symbolism of the eagle. Scholar of the American Indians' service in the Great War, Diane Camurat, seems to think along the same lines. While questioning the appropriateness of the sculpture, she suggests the eagle and Indian both incarnated wildness, freedom, and physical prowess, thus symbolizing the American participation in the war. Comments welcome. Cesare Battisti was born on 4 February 1875, in Trento, the seat of the Trentino province, then a part of Austria-Hungary. His parents were well-off shopkeepers in Trento. Although the Trentino had been part of Austria since the 1500s, it was Italian in language and culture. Five years before Battisti's birth, upon the capture of Rome from the Papacy, Italy became a unified nation with Rome as its capitol. The movement to unify Italy was called "Il Risorgimento" (The Resurgence"). But, the Trentino, Trieste, and Istria (the territory around Trieste) with mostly Italian people remained under Austrian rule. After 1870 a movement to liberate these unredeemed lands (Italia Irredente) began. Those members of this movement in Italy, or in the "occupied" lands, were called Irredentists. This was the milieu in which Cesare Battisti reached maturity. 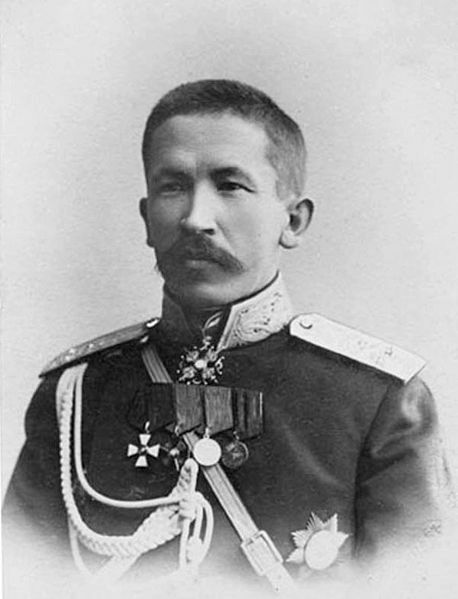 The Irredentist movement was the subject of much discussion and controversy. The Austrians, of course, were very much against the spreading of this ideology. The double empire was composed of many nationalities, and its leaders were fearful of ideas of separation taking hold, and they therefore suppressed Irredentism forcefully. In high school Cesare was interested in Italian history and culture, but in the Austrian-run schools the study of history ended with the Napoleonic era. Battisti began a search for information pertaining to Italian writers and poets and then began to copy parts of their works which were of interest to him. His interest in social conditions began at this time as well. He became a school leader and was quite popular. Some of his school friends were needy, and he helped them during hard times. He was able to do this because his family owned a grocery store. Some believe that his future interest in socialism was sparked by these experiences. When he was 18 he entered the University of Florence, where he graduated with honors, completing a thesis was on the geography of the Trentino. At the university he was also thoroughly introduced to socialism meeting some of the important Italian socialist thinkers and party leaders of the time. On completing his studies, he returned to Trento where he published a geographical review in which the economy, resources, and Italian cultural background of the Trentino were analyzed. In 1911 he was elected to the Diet (Parliament) in Vienna. His agenda was to get an Italian university established in Trieste. Until the turn of the century there was no university in Austria with an Italian curriculum. The University at Innsbruck was the only Austrian university that had a law course taught in Italian. Opponents to this program tried to split its supporters by suggesting that the university be established at Trento instead. Recognizing the ploy, and even though he was a Trentino deputy, he supported the Trieste site to keep the support for an Italian university intact. At the Diet, Battisti was sworn in by its youngest member and a fellow Italian, Alcide DeGasperi, who — after WWII — would become Italy's Prime Minister. But the two men didn't see eye to eye. De Gasperi, a member of the Catholic Party, and Battisti, a socialist and Irredentist, disagreed completely. De Gasperi's supporters disrupted socialist party meetings, and Battisti referred to De Gasperi sarcastically as "Von Gasperi." In 1909 Benito Mussolini was expelled from Switzerland and was then sent by the socialist party to Trento to be editor of the party newspaper L'Avvenire del Lavatore (The Coming of the Worker). Even though he and Battisti were both socialists, Mussolini was then anti-militarist, a pacifist, and an internationalist, and as such rejected Battisti's Irredentist views. Mussolini was soon expelled from Austria and was sent to Italy to be editor of the party paper, Avanti. Mussolini subsequently completely switched sides and by 1914 had become an ardent nationalist and pro-war agitator. When hostilities began in August 1914, he left Austria for Italy where he became very active in promoting an Italian war against Austria. He wrote articles for Mussuolini's Avanti, criticizing those socialists espousing pacifism. He wrote to the king and spoke at pro-war demonstrations whenever he had the opportunity. Italy's pro-war movement involved several kinds of people with various goals. Some, like the Futurists, believed that a war would strengthen a nation, making the people tougher and more able to rise to greatness. There were others that saw war as a method to unify the people, to develop a patriotic sense in a nation that had existed for only about 45 years. Some, like Mussolini, saw war as an opportunity to gain personal power. Others, like author Gabriele D'Annunzio, wanted a chance for personal aggrandizement, adventure, and honors. The king and some politicians wanted Italy to achieve great power status, to protect and expand its interests in the Balkans, and to gain some colonies in Africa and Asia Minor. Battisti's main goal was to unify all Italians, including those living in Italian areas of the Austrian Empire. His was a patriotism based on an ethnic-centered nationalism that even overrode his socialist views and put him at odds with the anti-war, internationalist tenets of the socialist party. 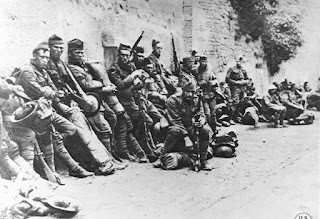 Later, when Italy entered the war against Austria in May of 1915, Battisti enlisted in the Italian Alpine Corps. He put his extensive knowledge of the geographical area of the Trentino at the disposition of the Italian Army and eventually joined the Edelo battalion of the 5th Alpini Regiment. He received a medal for valor and became a 2nd Lt. After seeing action in several engagements, Battisti was put on the staff of the 1st Army information office and was invited to speak in Milan honoring the Alpini Corps. 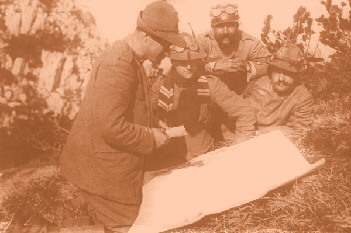 Administrative duty didn't suit him, and soon, after a massive Austrian attack in the Trentino (the 1916 Strafexpedition), he requested a transfer and received a posting to the Alpini Vicenza Battalion. During the Italian counterattack he was given command of the battalion's 2nd company. His unit was cut off and he was captured. With him was one of his subordinates, a 2nd Lt. Fabio Filzi from Istria, like Battisti, an Italian from Istria, another Austrian-ruled region. The two men were identified as Austrian subjects and therefore traitors. There are accounts that a fellow Italian had betrayed them. The two were put on a horse drawn cart, chained and heavily guarded. In this fashion they were carted off on the long trip to Trento. On the way they were insulted, spat upon, and stoned by people and soldiers who were egged on by the authorities. When they arrived at the castle Buon Consiglio in Trento a group of officials took turns beating the two prisoners. The next day, 12 July 1916, at the summary court martial, the two were quickly found guilty of treason and condemned to a form of hanging similar to strangulation. Battisti protested that they had been in captured in uniform on the field of battle and therefore should be considered POWs. This defense was rejected out of hand. 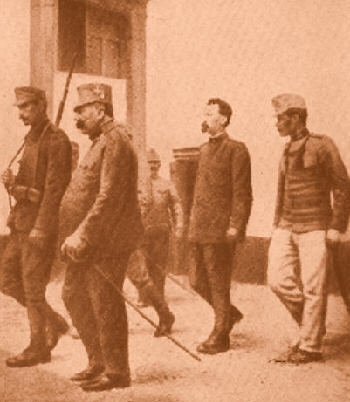 He requested a military execution by firing squad so as to not dishonor the Italian Army uniform, but the judge denied his request, and instead procured for him some shabby civilian clothes. Fabio Filzi was sentenced to the same fate. The prisoners were taken directly from the court to the gallows. Battisti was refused an opportunity even to write a last letter home. He turned down the last rites from a priest. At the first attempt to strangle him, the rope broke. According to tradition, when this kind of thing happened, the sentence would be commuted. 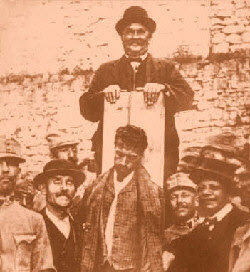 Instead, in Battisti's case a new rope was sent for and the execution proceeded. Battisti shouted "Viva Trento Italia! Viva l'Italia!" After the execution, Battisti's and Filzi's bodies were thrown in the sewer of the castle with no casket or marker. The Austrians photographed the execution and post cards were produced from them. The authorities hoped that this would serve as an example and be a deterrent to other minority groups. Instead the effort backfired, making martyrs of Battisti and Filzi and showing the Austrians in a barbaric light. They quickly realized this, stopped the distribution of the cards, and tried to recall the ones already distributed. But it was too late. The photos became propaganda tools in the hands of the Italians to whip up anti-Austrian feelings even more in Italy. Although condemned as a traitor in Austria, in Italy, even today some 80 years later, he is considered a patriot, hero, and martyr. In Trento there is a dramatic monument to him at the site of his grave. In towns and cities all over Italy there are streets and piazzas named after Cesare Battisti. Sources and Thanks: Historia, May–June, 1985 [no author cited]. Encyclopedia Italiana, 1932. Photos from Tony Langley, Rich Galli and the author. At 17 years old during the battle of Loos in 1915 Émilienne Moreau was decorated by the British and French for having killed single-handedly several German soldiers who were killing wounded British soldiers. The Germans never really took a liking to civilians who killed their soldiers, even in defense of the helpless, which it arguably was. So when they came back in 1940, she was in real deep trouble, wanted for murder. She (and husband and other family members) joined the Resistance and stayed out of German hands during the war by moving all over the place. After WWII she went into politics and made it to deputy minister. Not bad for a mine worker's daughter in early 20th-century France. Her story is one of those Great War fait-divers that would make a great movie. It's a wonder no French director has ever done one on her. The events of 1916–17 in Europe are the setting for this latest historical thriller by Edward Parr. This is the second installment in the author's "Kingdoms Fall" series and follows Kingdoms Fall — The Laxenburg Message (2013). This episodic book continues to tell the story of the major events of World War I through the perspective of two British officers working for the newly formed Secret Intelligence Service. We were introduced to our main protagonists, David Gresham, the lieutenant, already an undercover agent, and Captain James Wilkins, secretly the son of Lord Bartlett, in the first book of the series on the battlefields of Gallipoli where they formed a team. The first book saw the duo take on a series of increasingly difficult espionage missions that indirectly changed the path of the early years of the Great War. The fast pace of the second installation weaves intricate events as they unfold across the continent with Gresham and Wilkins as witnesses or players. The book opens with them chasing a mysterious German spy trying to incite rebellion in Ireland to undermine the war aims of the British Empire. While this theme continues, our novice spies once again take on their military role in the Battle of the Somme. The book is at its best when it describes action on the battlefields where our heroes shine…most of the time. However, given the fast pace, the book quickly moves back to explaining the diplomatic dealings of building and shifting alliances. 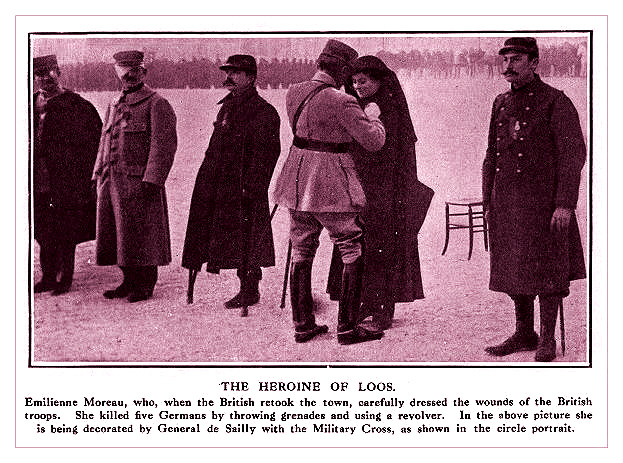 Thus the scenes quickly shift to Italy with a young Mussolini, to Salonika and the Greeks, and ultimately to Romania. As the daring duo leave for Romania the pace magnificently slows down. Just like the first book, Edward Parr does a splendid job of telling the story of the lesser-known theaters in the war. For example, the book accurately (with a bit of creativity on the role of Gresham and Wilkins) describes Romania's entry and subsequent failures in the war. As the adventures continues to unfold, the author further develops the characters' personal side. A new character is introduced, a nurse who is caring for one of our heroes but develops as a love interest for the other. The nurse Emma is American, an aide-mémoire for those Americans who romantically volunteered to serve in the war's early years. 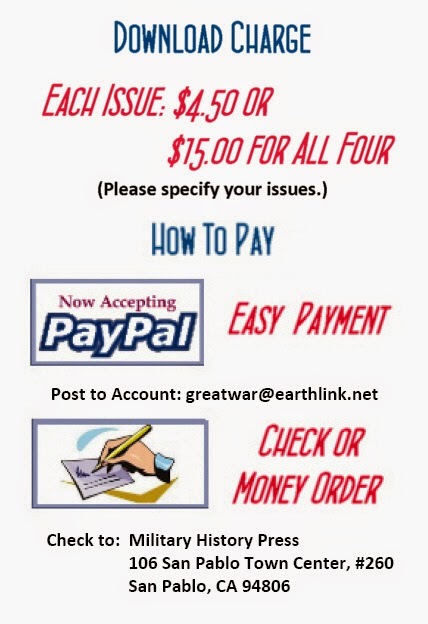 Emma becomes both a challenge and asset to Wilkins and Gresham as they move to their biggest adventure yet: keeping Russia in the war as an ally while its very empire is collapsing at the beginning of the Russian Revolution. 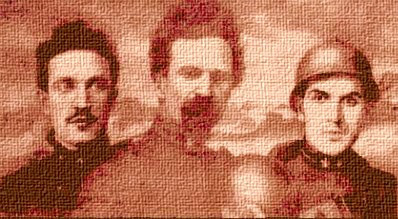 The tale touches on the complexities of a revolution where a young Stalin, Kerensky, and finally General Korniloff try to guide the fall of the empire and the future of Russia in their own visions. This collides with the mission of keeping Russia in the war, and ultimately each of our main characters has to choose his own dangerous path in the tumultuous events rapidly unfolding. Gresham, Wilkins, and even Emma shift between the roles of behind-the-scenes player, witness, and sometimes victim as the final scenes unfold. The storytelling is illustrative and action-packed. This book is highly recommended, and as a reader and historian I eagerly await the next in the "Kingdoms Fall" series. What Was the Score for Q-ships vs. U-boats? I keep discovering questions I never thought about asking about the war. I stumbled across on a BBC webpage that had the answer to a question I should have raised long ago. Just how did Q-boats match-up against their targets. The Q-ships, recall, were an improvised response to the U-boat threat that had the potential of starving Britain out of the war. They were designed to mimic the look of merchantmen to attract submarine attacks. U-boats, despite what you see in the movies, preferred surface attacks in the First World War. When the submarine approached, the ships guns were unmasked and the crews opened fire. The Q-ship's best hope, of course, was to get in the first shot before the U-boat's deck gun found its target or torpedoes were launched. The Q-ship, alas, was something of a sitting duck by this time. 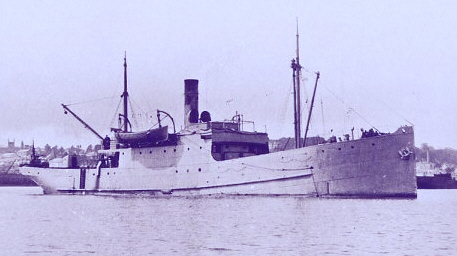 One Q-ship VC was awarded to Captain Harold Auten, whose ship was sunk in an engagement in Bigbury Bay. 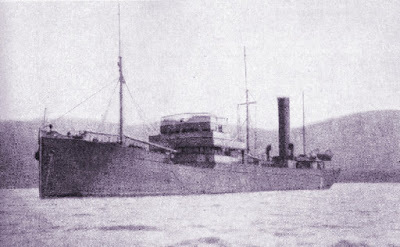 The most successful Q-ship, the HMS Penshurst (photo above), is credited with sinking two U-boats. Details are available for one attack. On 14 January 1917 she was attacked by UB-37. After the usual "abandon ship" tactics, the Penhurst awaited developments. The enemy closed within 700 yards and began firing. Though hit, the Penhurst replied effectively with the first shell from her 12-pounder striking the base of UB-37's conning tower. Other shells found their mark and the submarine sank. As America's war effort ramped up in 1917, there was a collective realization that the fleet of vehicles needed to support a semi-mechanized army needed some standardization. The Liberty truck was the solution. 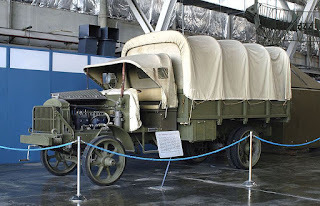 It was designed by the Motor Transport section of the Quartermaster Corps in cooperation with the members of the Society of Automotive Engineers. A group of leading automotive engineers was summoned to Washington in 1917 to design standardized trucks for the AEF. It took took 50 men 69 days to design a 1-½ ton "A" model and the 3–5 ton "B" model. Production of the Liberty B began in the fall of 1917, and the first models were delivered to the secretary of war on 19 October. Of the almost 9,500 produced by 15 manufacturers, more than 7,500 were sent overseas. The Liberty's four-speed transmission coupled with its 52-hp engine gave the truck a top speed of about 15 miles per hour. British people who lived or served in India often assimilated Hindi and Urdu words into their daily conversations. 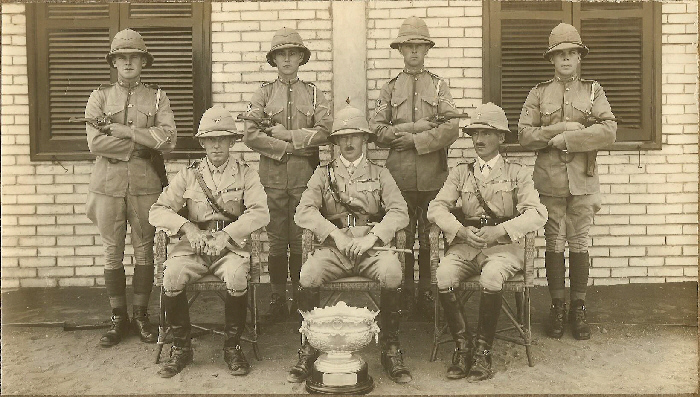 Gradually these were disseminated through the Indian Army and the colonial civilian population, and thanks to the First World War, throughout the British Army and the forces of the rest of the Empire. The label for this color comes from an Urdu word for dust. The Indian Army championship pistol team above are wearing khaki colored uniforms, first adopted in the 19th century. British officers referred to Germany's highly trained riflemen as "snipers." This word harks back to the Indian Army in the late 18th century when officers would go bird hunting in the hills and the tiny snipe was one of the hardest targets to hit. "Have a dekko" or "take a dekko" uses the Hindi word dekho meaning "look." Cushy was borrowed from the Urdu word kushī by the British in India and used to describe things associated with pleasure, happiness, or ease. British and Empire troops applied it to aspects of their lives in the forces, dubbing an easy job or a comfortable spot as "a cushy number." Evolved from the Urdu word bilāyatī for foreign or European, "Blighty" came to mean England, Britain, or simply "home." Troops of the First World War used "a Blighty one" or "a Blighty" to refer to a wound which would not be fatal but would get a man sent home. Gustaf Hellström was born in Kristianstad, southern Sweden, in 1882 and died in 1953. 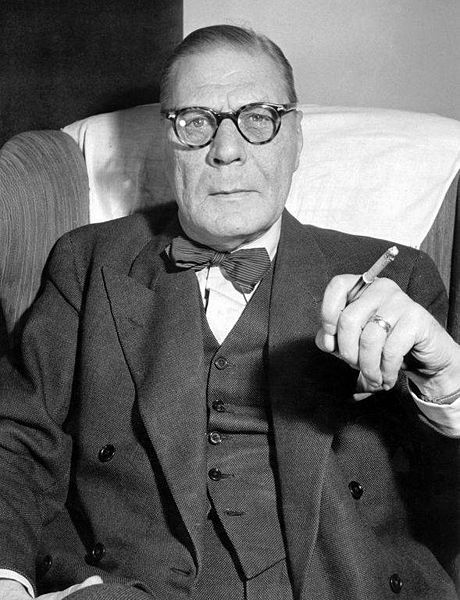 He was a novelist, journalist, and member of the Swedish Academy. 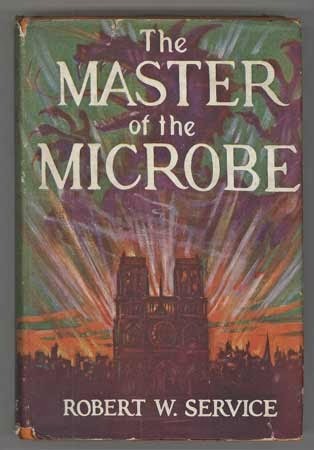 While he is best known for his novel Lacemaker Lekholm Has an Idea (1927; translated into English), he was also a reporter in France between 1911 and 1917 and in America from 1918 to 1923, where he followed the peace process (this resulted in two books, in Swedish). In both France and America Hellström worked for the Swedish daily newspaper Dagens Nyheter (The Daily News). His support of the Allies was unique among Swedish journalists, and Dagens Nyheter was the only Swedish daily newspaper to support the Entente Powers. The war continued to dominate Hellström’s thinking and writing long after it was over. While his newspaper reports provide detailed observations in Paris and at the front, they do not discuss war as a phenomenon. For Hellström’s views on the war in general we must turn to his Kulturfaktorn. Franska Stämningar under Världskriget (The Culture Factor. 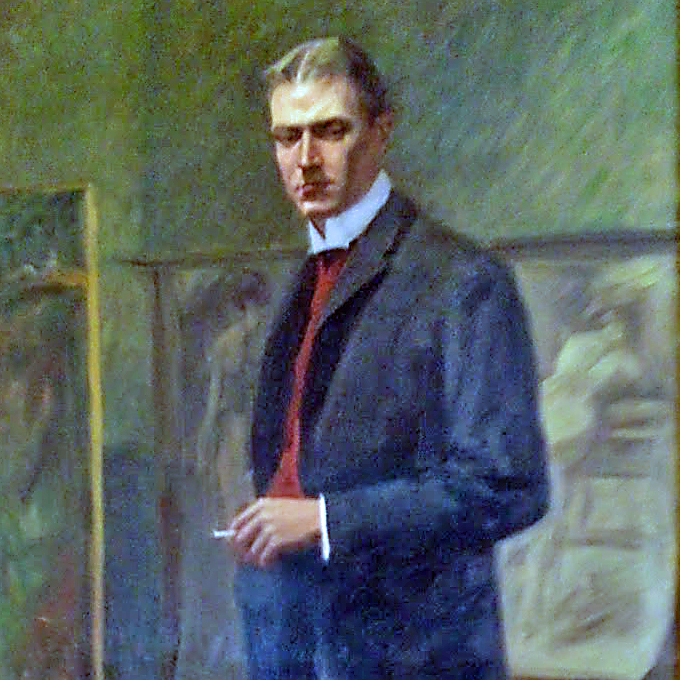 France During the War, 1916) and his novel Den Gången (That Time, 1944). In The Culture Factor, an attack on Carl von Bernhardi’s doctrine that “war is not merely a necessary element in the life of nations, but an indispensable factor of culture, in which a true civilized nation finds the highest expression of strength and vitality” (Germany and the Next War, 6), Hellström states that “nothing is too big, no river of blood too wide or too deep, when it comes to drowning the culture factor. There is no other means than the sword to destroy those who take to the sword themselves” (173). In the novel That Time, Stellan Petreus, a journalist and Hellström’s alter ego, comes to the conclusion that nothing, not even the love of a mother, can match the sacrifice that soldiers have made in war: “millions and millions have sacrificed their lives, security and freedom” (240) for their nation and their culture. In return, they have become ground in the machine of war: “a massive mill grinding the most valuable grains to a mixture of death, suffering and destruction” (355). This is a process, Petreus reflects, that far from realizing actually destroys the very aims war purports to defend. Hellström’s view of war permeates his novels and reports though it is never actually stated. Hellström started writing his reports in Senlis, 50 kilometers north of Paris, where he studied the rapidly growing anti-German feeling in France. Anti-Prussian himself but not anti-German, Hellström was initially surprised by the strength of the French animosity. His reports demonstrate, however, that he was soon to forget the distinction between Prussian and German, with the result that he invariably presented the Prussians/Germans as barbaric and cruel. The French, on the other hand, are depicted as patriotic and organized; and contrary to the idea prevailing in Sweden at the time, they were not degenerate but strongly patriotic, ready to fight for their country. On the outbreak of war Hellström moved to Paris; as a foreigner he was no longer welcome in Senlis and he needed ready access to information from the front. 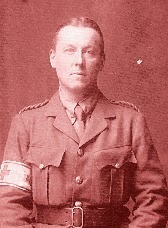 In the first months of the war he met soldiers on leave, interviewed them at railway stations, and visited hospital trains. Hellström showed that France was ready for the Germans and recorded with great pride the grand parade of volunteers at Place des Invalides in September 1914. His early reports provided new and detailed information about the first few months of the war, showing, for example, that the Germans suffered a major and humiliating defeat at the First Battle of the Marne (5–12 September) – a fact that had not been made clear in other Swedish newspapers. His report “The Living Dead: A Picture of War," based on the battle, features discussions with a non-commissioned officer from a North African infantry regiment and with a captain. Hellström took a back seat, allowing the two to discuss their experiences freely. The non-commissioned officer explained with pride but also sorrow how he was awarded a medal for bravery and how, of the 1200 men of his battalion who marched into battle, only 48 survived; of these, 20 were to die shortly afterward. When the captain left, Hellström asked the non-commissioned officer, “What was the worst part of the Battle?” (78) The answer “the bayonets . . . the swearing . . . the screaming” (78), summed up the situation in a few but well chosen words. When the non-commissioned officer explained that he had contracted tetanus, Hellström ordered him to “tell the story” (78), recognizing its considerable news value. The worst aspect was not the paralysis, explained the soldier, but the smell exuding from his wounded arm – that and hearing a doctor say that nothing could be done for him. Hellström allowed the story to unfold because he knew that it would become an important part of his article. In May 1915 Hellström was invited to take part in an official and also, at the time, unique visit to the front specially designed for reporters. He seized the chance to get “as close to the Germans as possible, to No Man’s Land, where the ravens fight over unburied dead bodies . . .” He stressed the unexpected nature of the visit, which he realized would be one of the greatest events of his life. 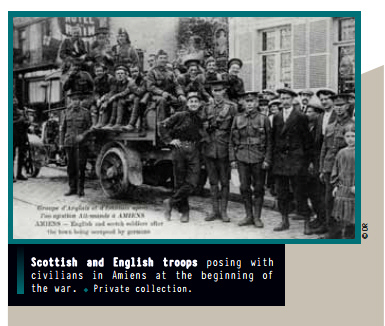 In Amiens he was only 12 miles from the German lines. He did not, however, focus on the sounds of battle and the presence of airplanes but on the inhabitants of the town: “they are waiting, unified, display a mixture of patriotism, gravity and wisdom . . . absolute wisdom”. He was excited at the prospect of visiting army headquarters and surprised to find that they were not housed in a castle or a park but a bleak factory, whose chimneys poured out black smoke and whose machines thundered constantly in the background. Hellström’s first sight of a battlefield was a shock: the beautiful meadow spread out before him hid, he soon discovered, between 100,000 and 200,000 soldiers crouched in trenches. The shocks continued: the sound of exploding guns was interspersed by birdsong; wild flowers were growing in abundance; and officers’ dugouts contained all kinds of home comforts. Hellström was also to see another side of life at the front, however: ruins, corpses, and the stench of decomposition. His walk through a tunnel reinforced the horror of war as he reflected on what would happen if the German and French tunnelers should meet: there would be “one big grave” filled with bodies ripped apart, screams and curses fit only for an “earthly hell." Hellström’s reports from Paris and the front gave Swedish readers a new view of the war, one that was not entirely welcome due to the pro-German feeling in the country and one that contradicted much of what was being written in Swedish newspapers in general. Hellström was anxious to preserve his memories of his years in the picturesque village of Senlis, in war-torn Paris and his few days at the front, reproducing them almost word for word in his earlier mentioned prose, in Kulturfaktorn. Franska Stämningar under Världskriget (The Culture Factor. France during the War, 1916) and his novel Den Gången (That Time, 1944). The Gustaf Hellström Association continues to honor the memory of Hellström as a reporter and last year published 1½ Mil Härifrån Står Världens Största Slag: Gustaf Hellström Som Korrespondent i Första Världskrigets Frankrike (9 Miles from Here the World’s Greatest Battle Is Taking Place: Gustaf Hellström as Correspondent in France During World War One), which contains Hellström’s reports on the first two years of the war. Our contributor, Jane Mattisson Ekstam, will be giving a lecture on Hellström as war reporter at the Swedish national book fair in Gothenburg in September this year. 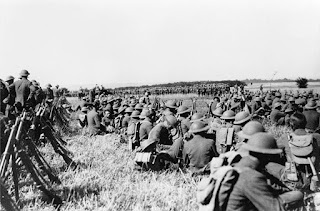 With the 99th anniversary of the famous battle coming in two weeks on 1 July, I've dug through the files and found some of the more memorable things said of the event. I found it hard, though, to find anything matching Kipling's poignant, "A Garden called Gethsemane, in Picardy it was. . .
1. Before the world grew mad, the Somme was a placid stream of Picardy, flowing gently through a broad and winding valley northwards to the English Channel. It watered a country of simple beauty. . . Then came the pestilence. 2. 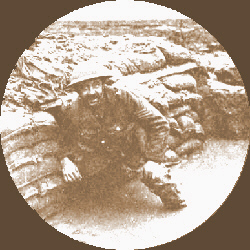 Every Englishman has a picture of the Somme in his mind, and I will not try to enlarge it. 3. The literature of 1 July 1916 is endless. Salutary at first, a proper corrective to the streams of propaganda claptrap about "laughing heroes" and "the Great Adventure" which had previously gushed forth, after a time it developed into a most mischievous mythology. 5. South of the Ancre was a broad-backed high ground, and on that ground a black vapour of smoke and naked tree trunks or charcoal, an apparition which I found was called Thiepval Wood. The Somme indeed! 6. During my whole life I have not found a happier hunting ground than in the course of the Somme Battle. In the morning, as soon as I had got up, the first Englishmen arrived, and the last did not disappear until long after sunset. 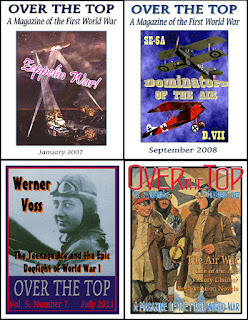 Boelcke once said that this was the El Dorado of the flying men. 7. It seemed all over, hardly 20 minutes from the start. It was a strong point and still was, even with reinforcements it would be hopeless, with those sodding machine guns still in action. Behind we could see where we started from, in front, the Jerry lines on slightly rising ground. We could see the shape of the Quadrilateral, like a squashed diamond, behind the bank. Judging by the damned chatter when we were going over, a hidden machine gun at every point. Quiet enough now, they had already done all the damage, not giving their position away now, leaving the Jerries in the line to do the odd firing. 8. Idealism perished on the Somme. 9. The tragedy of the Somme battle was that the best soldiers, the stoutest-hearted men were lost; their numbers were replaceable, their spiritual worth never could be. 10. It's the end of the 1916 winter and the conditions are almost unbelievable. We live in a world of Somme mud. We sleep in it, work in it, fight in it, wade in it and many of us die in it. We see it, feel it, eat it and curse it, but we can't escape it, not even by dying. Training Stateside to Go "Over There"
It is always noteworthy when a historian uncovers an unused primary source that sheds light on past events or attitudes. The author of this book, Dr. Edward A. Gutiérrez, made such a discovery in 2000 while working as an assistant in the Connecticut State Archives. He found virtually unopened boxes containing thousands of questionnaires completed by Connecticut service personnel upon their discharge after World War I. 1. What was your attitude toward military service in general and toward your call in particular? 2. What were the effects of camp experiences in the United States upon yourself—mental and physical? 3. What were the effects upon yourself of your overseas experience, either in the army or navy or in camp in France or in England? 4. If you took part in the fighting, what impressions were made upon you by this experience? 5. What has been the effect of all these experiences as contrasted with your state of mind before the war? Minnesota's and Utah's MSRs did not include these questions; however, Utah did include a section calling for remarks. 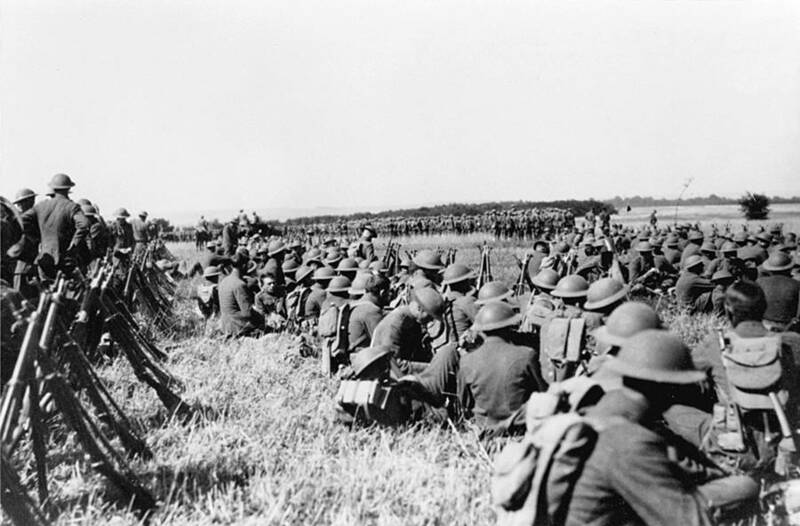 Dr. Gutiérrez's research indicates that except for the work of an occasional genealogist, these records, prior to the publication of Doughboys on the Great War, have never been used in any historical research. Service personnel from Connecticut and Virginia returned almost 28,000 MSRs, and of those, almost 1200 were fully completed, including answers to the five questions listed above. These serve as the basis for the research behind Doughboys on the Great War, and the author spent some 14 years going through these questionnaires and writing this book. Dr. Gutiérrez has supplemented the data in the MSRs with memoirs and diaries published by other World War I veterans, such as Alvin York. The author argues that these MSRs provide a unique look at the attitudes of returning World War I service personnel for several reasons. First is their quantity—Doughboys from the four states of Connecticut, Virginia, Utah, and Minnesota returned roughly 110,000 of the questionnaires in various stages of completion, dwarfing the scale of any other source of doughboy reminisces. Second, they provide a diverse sample, including "old stock" Americans, recent immigrants, first-generation Americans, and African-Americans. Third, and to the author perhaps the most important unique quality, is their timing. Questionnaires were completed between 1919 and 1923. The respondents were still young, with fresh memories, perceptions, and emotions. As World War I receded into history, the contribution of that generation of Americans was largely forgotten. By the middle of the 1930s, many Americans felt that U.S. participation in the war had been a big mistake. It was not until the 1960s and the 50th anniversary of the war that attention refocused on the World War I generation. Efforts were made to interview remaining personnel starting in 1975 by the U.S. Army Military History Institute (MHI). By this time, veterans ranged in age from their late 70s to early 90s. Dr. Gutiérrez quite reasonably argues that by this time memories had faded, emotions had been tempered ,and perceptions had changed. The author contends that the true voice of World War I Doughboys is to be found in the MSRs instead of reflections corroded by the passage of decades. Using the MSRs, Dr. Gutiérrez examines various aspects of a Doughboy's World War I experience: what motivated them to serve, how training affected them, how the experience of combat impacted them, and what they looked forward to after returning home. Over and over again and again, one common attitude infuses almost every page. The World War I generation was driven by a simple and innocent sense of patriotism and duty. For those who were "old stock" Americans, in their youth they were greatly influenced by veterans of the Civil War who filled them with stories of romance and heroism from that war. They were also influenced by books such as Stephen Crane's, The Red Badge of Courage, first published in 1894. The easy victory of the Spanish-American War and the speeches and writings of that war's most famous hero and the most influential pre-war American, Theodore Roosevelt, combined to convince them that service in war was a way to demonstrate their manliness, their sense of duty, and their patriotism. They were in effect what historian Richard Slotkin, in his excellent book Lost Battalions: The Great War and the Crisis of American Nationalism, called them—"sons of Theodore Roosevelt." 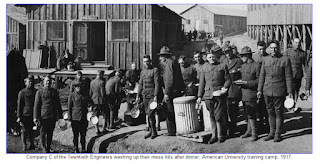 A key feature of American servicemen in World War I was their diversity of origin, religion, and occupation. Dr. Gutiérrez quotes sources showing that almost 500,000 Doughboys in the A.E.F. were foreign born. [Editor's note: This figure seems somewhat high. It would equate to about 25% of the 2,000,000 men who served overseas. Most sources report figures in the range of 18 to 20 percent, which is still a remarkable statistic.] Many more were first generation Americans. Many of these future Americans or newly minted Americans saw service in the war as a way to prove that they were worthy of becoming Americans. Dr. Gutiérrez found this was especially true of Italian and Jewish Americans, two groups that were viewed negatively by a large number of their fellow countrymen. Many wrote that they wanted to pay America back for the opportunity and freedom they had found in their new home. African-Americans hoped their service would lead to the recognition of their rights and more equal treatment at home after the war. As it turned out, the war proved not to be the romantic adventure they had expected. Many used the familiar quote from General Sherman about war being hell, but most valued the comradeships developed during the war, felt the war experience made them a better person, and many said they would answer their country's call to serve if needed again. The only section of the book that gave me pause was the section on shell shock and its modern namesake, PTSD. In this part the author seems to be editorializing on modern attitudes toward the effects of combat. I don't necessarily disagree with his comments, but I'm not sure of his qualifications to make these statements, and I question what they have to do with a book on World War I servicemen. Other than that, I found this book to be an entertaining and interesting read, opening a long closed window on the attitudes of World War I American serviceman. 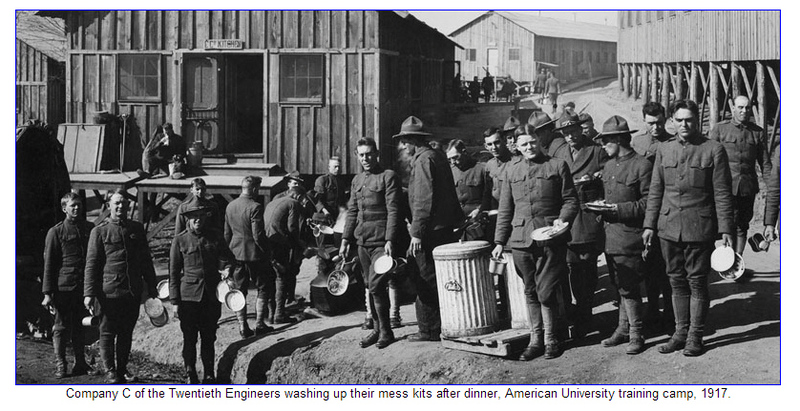 Hopefully, these MSRs will prove be a valuable source to future scholars of the American experience in World War I. After he had parted ways with Dan McGrew, the Lady known as Lou, and Clancy of the Mounted, Robert Service, the poet laureate of the Yukon, found his way to the Western Front as an ambulance driver. His Rhymes of a Red Crossman has some interesting war pieces, and his postwar Parisian writings include the classic "The Absinthe Drinkers". He stayed in France, married a French lady, and wrote mediocre novels, including one about werewolves. He never quite gave up on the war, however. Of his several novels, The Master of the Microbe: A Fantastic Romance (1926) is science fiction, featuring a deadly "Purple Pest" virus developed by a German mad scientist who wishes to wreak vengeance on Europe for the German defeat in World War One by infecting the continent with plague; but it is stolen from him by an antihero master-criminal. The further action involves proto-superhero behavior on the part of characters whose costumes disguise their true identity. Europe is saved in the end. One reviewer described the work as a "gripping but unlikeable thriller." ANZAC Commemorative Stamps from "Down Under"
This five-stamp issue is the second in a five-year series commemorating World War I and focuses on Gallipoli, a campaign that would in time be seen as crucial in shaping Australian national consciousness. The events represented spanned from 25 April 1915 to 8 January 1916. The subjects are the 25 April landing, Lance Corporal Albert Jacka, VC, the August Battle at Lone Pine, "The Man with a Donkey" – John Simpson Kirkpatrick (representing field medicine) and the evacuation from the peninsula. Also, the second set of a five-year program New Zealand's 1915 series features ten stamps of various denominations. It subjects include yhr 25 April Landing, nurse Evelyn Brooke, hospital ship The Haneno, the action of August at Chunuk Bair, and several traditions assoicated with the war. 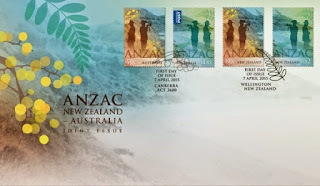 The special connection between New Zealand and Australia is reflected in the design of the stamps and coins of this commemorative issue. The 80c stamp features the iconic Australian golden wattle and incorporates hues that represent Australia’s sunburnt earth and blue skies, while the $2.00 stamp features New Zealand’s silver fern and integrates the lush greens and blues of New Zealand’s fertile landscape. 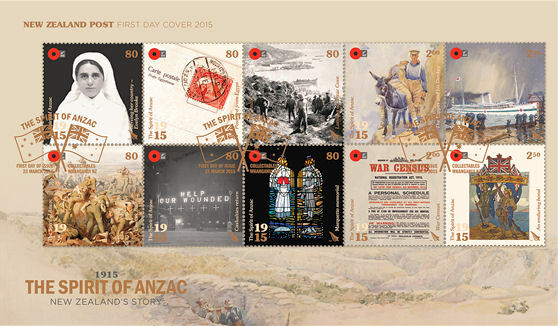 Across both stamps and coins stand two soldier silhouettes from an Anzac memorial service - a catafalque sentry and a bugler sounding the Last Post. 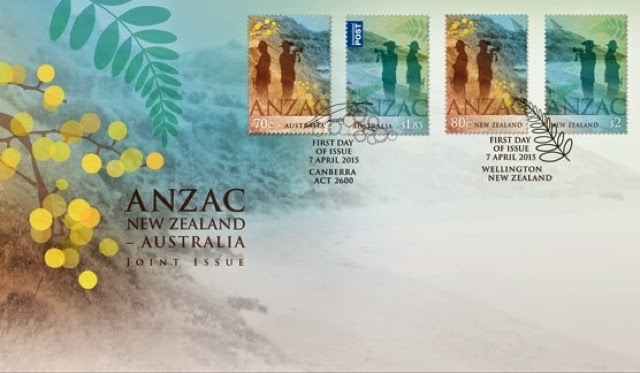 A background image of Anzac Cove, Gallipoli extends over both stamps and coins, creating a design reflecting the unity of our Anzac alliance. 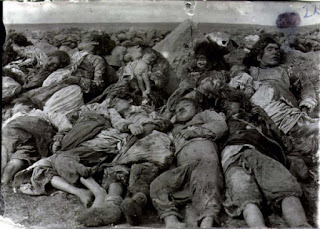 When I returned to Aleppo in September 1915 from a three months' holiday at Beirut, I heard with horror that a new phase of Armenian massacres had begun which were far more terrible than the earlier massacres under Abd-ul-Hamid, and which aimed at exterminating, root and branch, the intelligent, industrious, and progressive Armenian nation, and at transferring its property to Turkish hands. Such monstrous news left me at first incredulous. I was told that, in various quarters of Aleppo, there were lying masses of half-starved people, the survivors of so-called "deportation convoys." In order, I was told, to cover the extermination of the Armenian nation with a political cloak, military reasons were being put forward, which were said to make it necessary to drive the Armenians out of their native seats, which had been theirs for 2,500 years, and to deport them to the Arabian deserts. I was also told that individual Armenians had lent themselves to acts of espionage. "Opposite the German Technical School at Aleppo, in which we are engaged in teaching, a mass of about four hundred emaciated forms, the remnant of such convoys, is lying in one of the hans. There are about a hundred children boys and girls) among them, from five to seven years old. Most of them are suffering from typhoid and dysentery. When one enters the yard, one has the impression of entering a mad-house. If one brings them food, one notices that they have forgotten how to eat, Their stomach, weakened by months of starvation, can no longer assimilate nourishment. If one gives them bread, they put it aside indifferently. They just lie there quietly, waiting for death. "Amid such surroundings, how are we teachers to read German Fairy Stories with our children, or, indeed, the story of the Good Samaritan in the Bible? How are we to make them decline and conjugate irrelevant words, while round them in the yards adjoining the German Technical School their starving fellow-countrymen are slowly succumbing? Under such circumstances our educational work flies in the face of all true morality and becomes a mockery of human sympathy. "'Ta'alim el aleman' ('the teaching of the Germans') is the simple Turk's explanation to everyone who asks him about the originators of these measures. "Mohammedans, too, of more sensitive feelings—Turks and Arabs alike—shake their heads in disapproval and do not conceal their tears when they see a convoy of exiles marching through the city, and Turkish soldiers using cudgels upon women in advanced pregnancy and upon dying people who can no longer drag themselves along. They cannot believe that their Government has ordered these atrocities, and they hold the Germans responsible for all such outrages, Germany being considered during the war as Turkey's school-master in everything. Even the mollahs in the mosques say that it was not the Sublime Porte but the German officers who ordered the ill-treatrnent and destruction of the Armenians. At the time when I composed this report, the German Consul at Aleppo was represented by his colleague from Alexandretta—Consul Hoffmann. Consul Hoffmann informed me that the German Embassy had been advised in detail about the events in the interior in repeated reports from the Consulates at Alexandretta, Aleppo and Mosul. He told me that a report of what I had seen with my own eyes would, however, be welcome as a supplement to these official documents and as a description in detail. He said he would convey my report to the Embassy at Constantinople by a sure agency. I now worked out a report on the desired lines, giving an exact description of the state of things in the han opposite our school. Our presence had no ameliorating effect whatever, and what we could do personally came to little. Frau Spiecker, our brave, energetic colleague, bought soap, and all the women and children in our neighbourhood who were still alive—there were no men left—were washed and cleansed from lice. Frau Spiecker set women to work to make soup for those who could still assimilate nourishment. 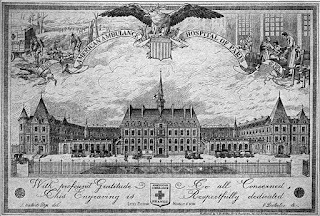 I, myself, distributed two pails of tea and cheese and moistened bread among the dying children every evening for six weeks; but when the Hunger-Typhus or Spotted-Typhus spread through the city from these charnel houses, six of us succumbed to it and had to give up our relief work. Indeed, for the exiles who came to Aleppo, help was really useless. We could only afford those doomed to death a few slight alleviations of their death agony. One of them, Herr Greif, of Aleppo, reported corpses of violated women lying about naked in heaps on the railway embankment at Tell-Abiad and Ras-el-Ain. Another, Herr Spiecker, of Aleppo, had seen Turks tie Armenian men together, fire several volleys of small shot with fowling-pieces into the human mass, and go off laughing while their victims slowly perished in frightful convulsions. Other men had their hands tied behind their back and were rolled down steep cliffs. Women were standing below, who slashed those who had rolled down with knives until they were dead. A Protestant pastor who, two years before, had given a very warm welcome to my colleague, Doctor Graeter, when he was passing through his village, had his finger nails torn out. In an Arab village on the way to Aleppo Herr Holstein, the German Consil from Mosul, saw shallow graves with freshly-buried Armenian corpses. The Arabs of the village declared that they had killed these Armenians by the Government's orders. One asserted proudly that he personally had killed eight. 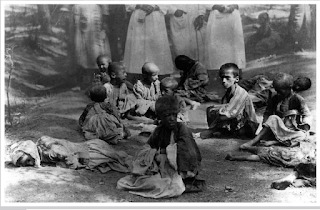 In many Christian houses in Aleppo I found Armenian girls hidden who by some chance had escaped death; either they bad been left lying exhausted and had been taken for dead when their companions had been driven on, or, in other cases, Europeans had found an opportunity to buy the poor creatures for a few marks from the last Turkish soldier who had violated them. All these girls showed symptoms of mental derangement; many of them had had to watch the Turks cut their parents' throats. I know poor things who have not had a single word coaxed out of them for months, and not a smile to this moment. A girl about fourteen years old was given shelter by Herr Krause, Dept Manager for the Bagdad Railway at Aleppo. The girl bad been so many times ravished by Turkish soldiers in one night that she had completely lost her reason. I saw her tossing on her pillow in delirium with burning lips, and could hardly get water down her throat. At Adana I saw a crowd of Armenian orphans marching through the streets under a guard of Turkish soldiers; their parents have been slaughtered and the children have to become Mohammedans. Even here there have been cases in which adult Armenians were able to save their lives by readiness to accept Islam. Sometimes, however, the Turkish officials first made the Christians present a petition to be received into the communion of Islam, and then answered very grandly, in order to throw dust in the eyes of Europeans, that religion is not a thing to play with. These officials preferred to have the petitioners killed. Men like Talaat Bey and Enver Pasha, when prominent Armenians brought them presents, often tempered their thanks with the remark that they would have been still better pleased if the Armenian givers had made their presents as Mohammedans. A newspaper reporter was told by one of these gentlemen, "Certainly we are now punishing many innocent people as well. But we have to guard ourselves even against those who may one day become guilty." On such grounds Turkish statesmen justify the wholesale slaughter of defenceless women and children. A German Catholic ecclesiastic reported that Enver Pasha declared, in the presence of Monsignore Dolci, the Papal Envoy at Constantinople, that he would not rest so long as a single Armenian remained alive. The object of the deportations is the extermination of the whole Armenian nation. This purpose is also proved by the fact that the Turkish Government declines all assistance from Missionaries, Sisters of Mercy and European residents in the country, and systematically tries to stop their work. A Swiss engineer was to have been brought before a court-martial because he had distributed bread in Anatolia to the starving Armenian women and children in a convoy of exiles. 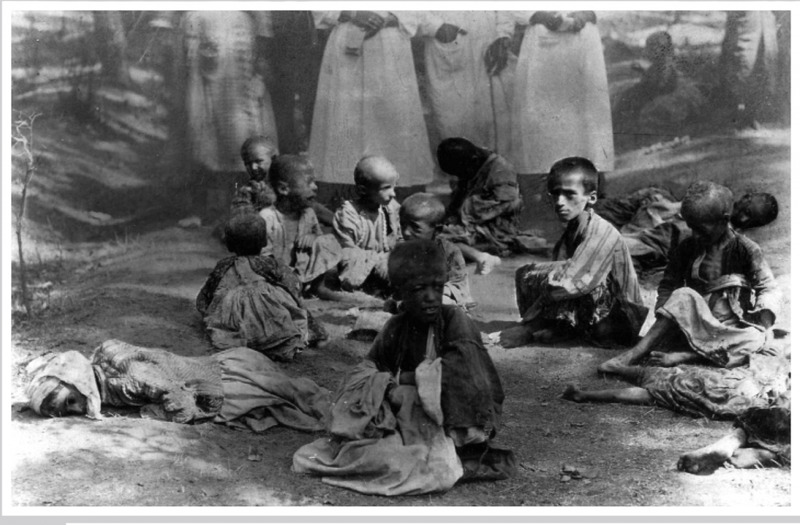 The Government has not hesitated even to deport Armenian pupils and teachers from the German schools at Adana and Aleppo, and Armenian children from the German orphanages, without regard to all the efforts of the Consuls and the heads of the institutions involved. The Government also rejected the American Government's offer to take the exiles to America on American ships and at America's expense. The opinion of our German Consuls and of many foreigners resident in the country about the Armenian massacres will some day become known through their report I can say nothing about the verdict of the German officers in Turkey. I often noticed, when in their company, an ominous silence or a convulsive effort to change the subject when any German of warm sympathies and independent judgment began to speak about the Armenians' frightful sufferings. After the massacres of 1909 a kind of reconciliation banquet was held at Adana, in which the heads of the Armenian clergy took part as well as high Turkish officials. The German Consul, Buge, who was present, related that an Armenian ecclesiastic got up and said in his speech "It is true that we Armenians have lost much in these days of massacre—our men, our women, our children and our goods. But you Turks have lost more; you have lost your honour." Three years ago I was sent by the Foreign Office as higher grade teacher to the German Technical School at Aleppo. The Prussian Provincial School Board at Magdeburg specially enjoined upon me, when I went out, to show myself worthy of the confidence reposed in me in the grant of furlough to take up this educational post at Aleppo. I should not be fulfilling my duty as a German official and an accredited representative of German culture, if I consented to keep silence in face of the atrocities of which I was a witness, or to look on passively while the pupils entrusted to me were driven out to die of starvation in the desert. The Young Turk has the European ideal of a united national state always floating before his eyes. He hopes to turkify the non-Turkish Mohammedan races—Kurds, Persians, Arabs, and so on—by administrative methods and through Turkish education, reinforced by an appeal to their common interests as Mohammedans. The Christian nations—Armenians, Syrians and Greeks—alarm him by their cultural and economic superiority, and he sees in their religion an obstacle to turkifying them by peaceful means. They have, therefore, to be exterminated or converted to Mohammedanism by force. The Turks do not suspect that, in doing this, they are sawing off the branch on which they are sitting themselves. Who is to bring progress to Turkey if not the Greeks, Armenians and Syrians, who constitute more than a quarter of the population of the Empire? We are told now in German newspapers of the Turks' hunger for education and of how they are thronging eagerly to learn German. There are even reports of language courses for adults which have been started in Turkey. They are certainly started, but with what results? They go on to tell one of a language course at a Technical School which opened with twelve Turkish teachers as pupils. The author of this story forgets, however, to add that, after four lessons, only six pupils put in an appearance; after five lessons, five; after six lessons four, and, after seven lessons. only three, so that after eight lessons the course came to an end, through the laziness of the pupils, before it had properly begun. If the pupils had been Armenians they would have persevered until the end of the school year, learnt patiently, and come away with a respectable mastery of the German language. 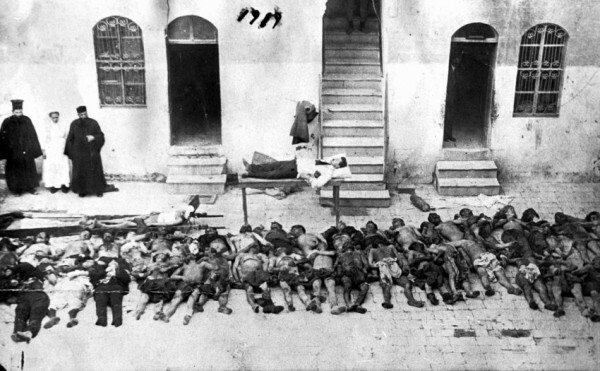 What is Germany's duty and, indeed, the duty of every civilised Christian nation in face of the Armenian massacres? 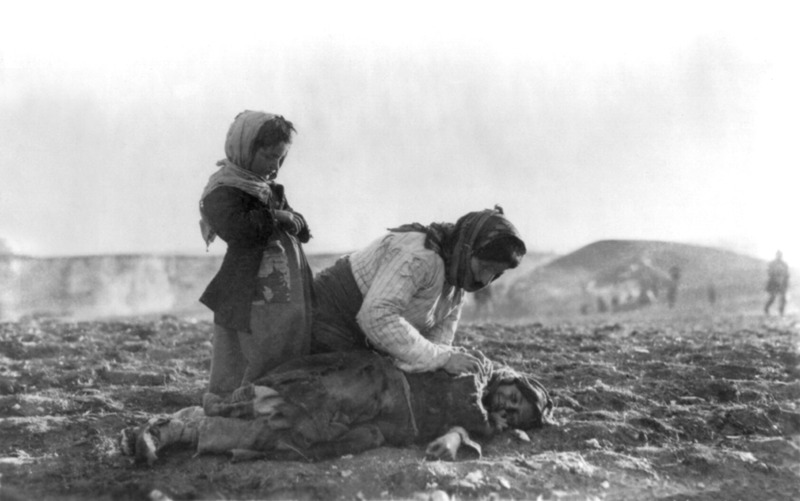 We must try every means of saving the half million of Armenian women and children who may still be alive in Turkey to-day, and who are abandoned to death by starvation, from an end which would be a disgrace to the whole civilised world. The hundreds of thousands of deported women and children who have been left lying on the borders of the Mesopotamian desert, and on the roads leading thither, can only maintain their miserable existence a short time longer. How long can people really support life by picking grains of corn out of horse-dung and depending for the rest upon grass? Months of insufficient nourishment and the prevailing dysentery will have brought countless numbers into a state past help. But at Konia a few thousand Armenians are still alive--educated people from Constantinople, who were in easy circumstances before their deportation, doctors, writers, merchants—and these could still be helped before they too succumb to the fate that threatens all. There are 1,500 Armenians in good health—men, women and children, including grandmothers sixty years old and many children of six and seven-who are still at work on a section of the Bagdad Railway between Eiran and Entilli, near the big tunnel, breaking stones and shovelling earth. For the moment they are being looked after by Herr Morf, Superintendent Engineer of the Bagdad Railway; but the Turkish Government has registered their names too. As soon as their work is finished, as it will be in perhaps two or three months' time from now, and they are no longer wanted, "new homes will be assigned to them,"—that is, the men will be taken off and slaughtered, the pretty women and girls will find their way into harems, the remainder will be driven hither and thither without food through the desert until all is over. 1975 Reprint of Dr. Martin Niepage's original 1917 report.